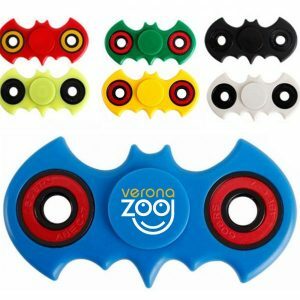 Custom fidget spinners are an exciting addition to a lineup of fun and exciting toys for this year. These spinning widgets started to appear in mid-to-late 2016 but have seen a surge in interest in 2017. The word-of-mouth effect pushed fidget spinners into popular culture, and the hype has yet to die down! We encourage you to design your own fidget spinner design to give your customers a one-of-a-kind product they cannot find anywhere else. As its name suggests, branded fidget spinners have been designed to help reduce fidgeting. 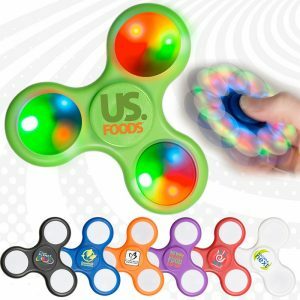 From overactive children to adults seeking relief from daily life in the office, we’ve all been struck with the urge to fidget at some point in time – but until now, there has never been a unique toy to help resolve the issue. Instead office workers engage in disruptive habits like clicking pens or tapping nails on the desk. 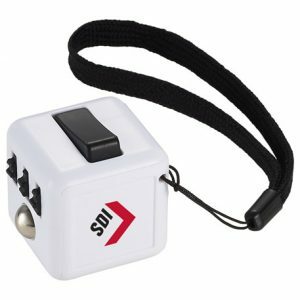 Promotional finger spinners will not disturb co-workers– with many anecdotal reports suggesting that the hypnotic whizz of the spinner increases a person’s concentration level. Additionally, the fidget spinner requires only one hand, which allows your other hand free to complete any tasks or work you may have. 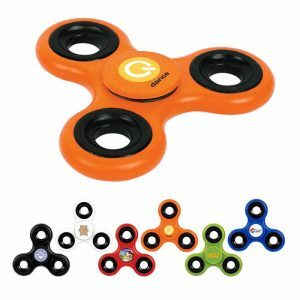 Personalized fidget spinners are the top-trending promotional product aimed to propel your company logo to the center of attention. 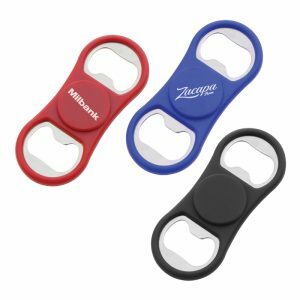 Our branded fidget spinners use only the best materials, and are designed for giveaway at corporate events, parties, trade shows, company gatherings and anywhere else you would like to promote your brand. Custom fidget spinners come in all different shapes and sizes, varying in price depending on how extensively modified they are. Personalized fidget spinners have the sought-after spinning functionality, but premium custom spinners may also glow in the dark, or even have LED lights installed. Custom shapes and sizes are also available starting to make their way to retail. 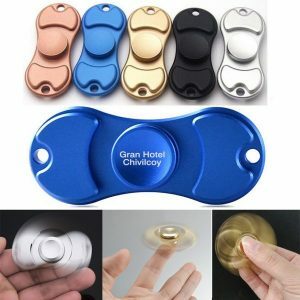 Our premium metal fidget spinners function as a more upscale alternative to the plastic material fidget spinners, making them a unique client or employee appreciation gift. 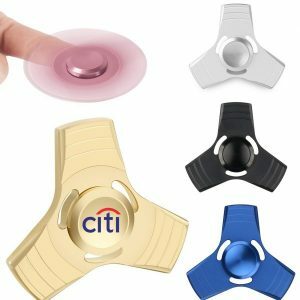 Don’t even think about getting the same old boring promotional item you get every year- custom fidget spinners make a relevant and popular alternative gift item. 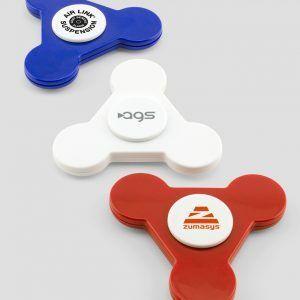 Promo Excitement has some of the most recent, popular, and sought-after custom fidget spinner designs available, and all are ready to be personalized with your own custom logo or brand design. Some of our past clients include athletic teams, music bands, trade show organizers, fundraiser teams, museums, and more! Curious to see how your logo looks on one of our fidget spinners? Open the chat bar at the bottom of this page and request a virtual mockup. 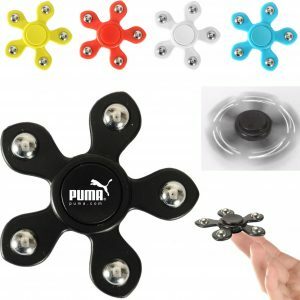 And remember, we aim to provide only the most competitive prices on fidget spinners. 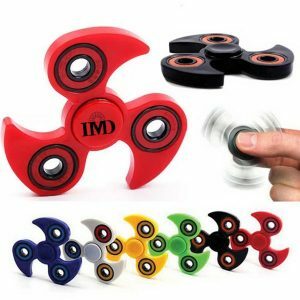 Imprinted fidget spinners are low cost and can fit the needs of any marketing or advertising budget. We meticulously print every logo detail on the fidget spinner’s center cap to make it look and feel like a promotional product you can be proud of. Get your brand in client or employee hands today with a product they won’t be able to stop playing with!